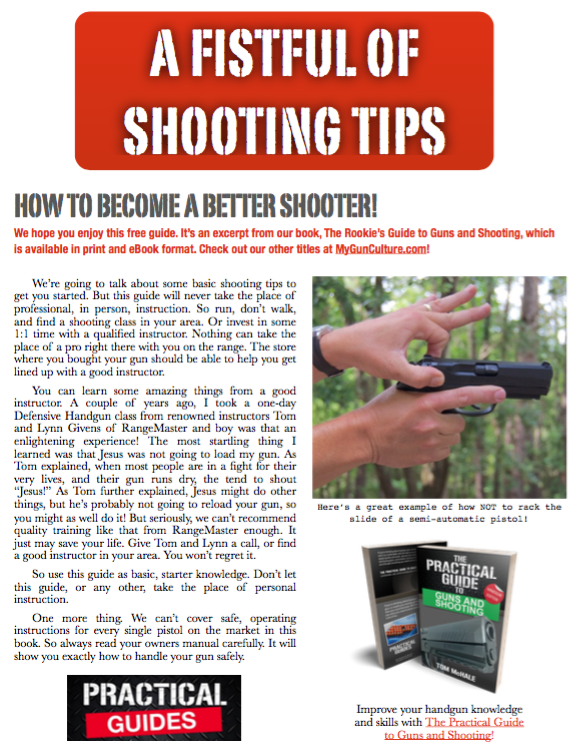 You are here: Home / Shooting Tips / Gun Science: What’s “Knockdown” Power? OK, so that was a trick question because there’s really not much to “knockdown power” at least in the literal sense. Sure, a cannon would certainly knock you over, but a handgun? Not so much. Let’s explain. On one of those “let’s try this” days, we put a bulletproof vest on a 50-pound bag of sand and shot a bunch of handgun rounds at it. No caliber could even come close to tipping the bag over. Handguns are certainly lethal and can cause all sorts of reactions in the recipient of a handgun shot. One who catches a handgun round might fall, jump, flinch, or do absolutely nothing at all. And therein lies the myth. There are lots of factors that cause physical reactions to a handgun shot. Among them are fear, pain, structural damage, or “electrical” damage just to name a few. What doesn’t happen is a physical “knock you over” force. To grossly oversimplify the physics involved, think of two factors: kinetic energy and momentum. Kinetic energy, usually expressed as foot-pounds for ammunition, can be thought of as potentially destructive energy. Think about a a high-speed drill bit. That will certainly cause a ruckus in a piece of soft wood, but it won’t send that lumber flying through a plate glass window, or “knock it down” if you will. The other “energy” component is momentum. Think of that as the ability to physically move an object. When you whack one of those wooden balls with a Croquet mallet (OK, so few of us probably do that, but you get the point) the ball goes flying across the meticulously manicured lawn. Back to handgun bullets. Even the venerable .45 ACP bullet has very little momentum. While there is plenty of kinetic energy (drill bit analogy here) there is not enough physical momentum to move anything of significance. If you take away the pain, fear, structural, and electrical damage factors, it’s just not going to “knock over” a 200-pound person. Yet people say it has knockdown power. “Knock down power” is slang terminology for delivered energy, and contrary to this author’s opinion, can make a difference in lethality, especially when it comes to hunting big game. There is a reason why those who hunt bears and moose with handguns usually choose magnum calibers and not a .22LR. The exact same principles of physics can also be applied to human targets.